Early Sunday morning, my 93-year-old grandfather passed away. It’s funny how I’ve thought about things today that I haven’t thought about in years. My brother reminded me of the “spinny things” that he showed us one Christmas. I found a picture of us, scanned it, and sent it to Dennis to use for his own blog post. 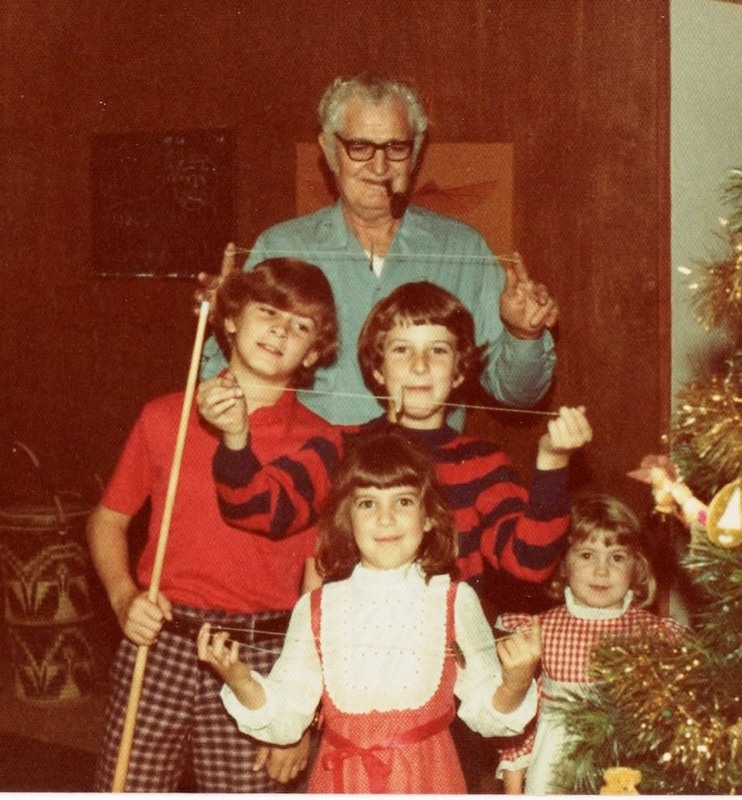 Paw-Paw always had that pipe in his mouth. I can almost smell his tobacco right now. I don’t remember when he quit smoking. I’m sure he did it under duress. 😀 There have been a few times in my adult life when I smelled that tobacco, and thought of him. He loved to tell stories about his life. He would talk and then laugh a rich, cackling guffaw. I’m not sure “cackling” is the best word for it, because that word usually has a negative connotation. His laughs were hearty, even when he was the only one who got the joke. For a long period of time, he was on a medication that cause his speech to be almost unintelligible. Almost. The words that we could always understand were the curse words. He liked those a lot. As kids, my siblings, cousins, and I thought that was pretty hilarious. Not long after I got married, my husband and I spent a day with my grandparents. We hadn’t intended the visit to turn into an all-day event and dinner out, but it did. I don’t recall hearing my grandfather talk for so long about so many subjects. It was a wonderful visit. Rest in peace, Paw-Paw. Go in Love, knowing you are loved.